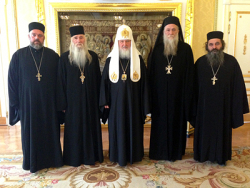 On 25 September 2013, His Holiness Patriarch Kirill of Moscow and All Russia received the Orthodox clergymen from Abkhazia at the Patriarchal residence in St Daniel’s Monastery. The meeting took place at the instance of the representatives of the Abkhazian clergy. Taking part in the meeting with His Holiness Patriarch Kirill were Rev. Vissarion Aplia, Hieromonk Ignaty (Kiut), Hieromonk Vasilisk (Leiba) and Rev. Dolmat Gopia. They were joined in the meeting by Archpriest Nikolai Balashov, vice-chairman of the Moscow Patriarchate’s Department for External Church Relations. The representatives of the Abkhazian clergy informed His Holiness of the situation in ecclesiastical affairs in their mother land and the negative consequences of the schismatic activities of the suspended clerics who, violating the canons of the Church, celebrate the Divine Liturgy and other services at the New Athos Monastery of St Simon the Zealot. The participants in the meeting expressed their concern over the current unsatisfactory ecclesiastical situation in the Republic and noted the necessity to settle it in strict compliance with the holy canons of the Church.